Axis1 Putters: Perfectly Balanced, Perfect Putter? Since golf effectively put the kibosh on anchored putters, club-making companies have been forced to innovate. This has been a major change considering the putter is the club that most looks like its ancestors. Think about it. The drivers, irons, wedges and woods date the game even going 20 years back. The putters of yesteryear, on the other hand, at least look usable. All that means is that the innovations have been more subtle. One such emergence, in light of the anchor ban as well as the rise of analytics in all sports, is the Axis1 putter. The recent line of products seems to achieve that goal. Axis1 has rolled out the Eagle, Umbra, Joey and Joey-C. The Eagle, Joey and Joey-C are described as “classic blades,” while the Umbra is a “modern mallet.” All have varying weights and subtle differences in features, but there is one common theme: they carry the company tagline. The “perfectly balanced” putter comes from the design. The distribution of weight is such that each putter has a consistent center of gravity. The idea is that this allows players to maintain a straighter putting stroke no matter the feebleness or inconsistency of their grip. The website shows this in a few diagrams. On one hand, this helps amateurs who struggle with the finer points of putting. The effects are twofold. Firstly, players will putt better even as they tire late in rounds or on particularly hot days. Secondly, the confidence that comes from that will allow them to ease up on their approach shots. For example, a player who struggles to putt from 20-30 feet will almost always go flag hunting for fear of three- and four-putts. With the Axis1, or improved putting in general, players can take more conservative—and often—better shots into greens. On the flip side, the more the club works for the players, the less the players work in general. 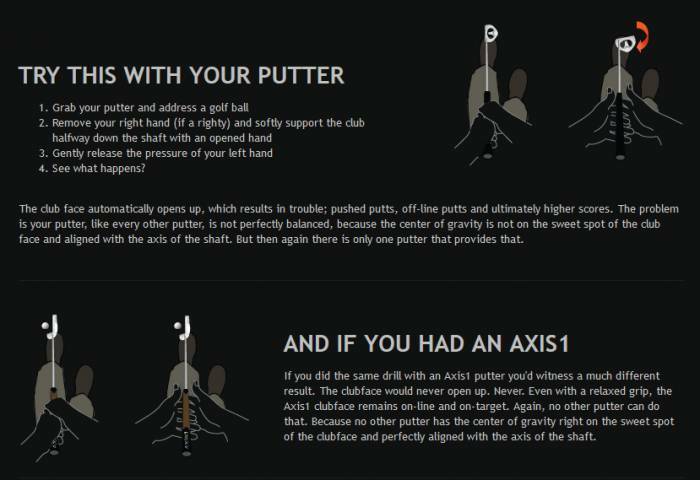 In other words, they don’t have to fine-tune their putting as much as someone without an Axis1. Is this a compromise in terms of the spirit of golf? You can decide. Perhaps with the Axis1 you can putt like them. Previous post: Higher Launch Angle: How Can It Help You?